Samsung Electronics Australia has launched a multi-million dollar campaign to leverage its global sponsorship of the Olympics, of which Samsung Electronics is the Worldwide Olympic and Paralympic Partner in the wireless communications equipment category. The company has also sponsored Australian Olympians Alex ‘Chumpy’ Pullin and Scotty James and Paralympian Jessica Gallagher. It’s also a partner of the Australian Olympic Team, providing all athletes and team officials with a Samsung smartphone. As part of the campaign Samsung has developed ‘Design Your Moment’, a collaboration between two of its ambassadors and up-and-coming Australian artists to help inspire the athletes in their pursuit for gold at Sochi 2014. ‘Design Your Moment’ sees boarder cross snowboarder Alex ‘Chumpy’ Pullin work with music producer Sampology to create a new track, ‘Show Me’, which will motivate Chumpy before his steps out for his race at the Games. 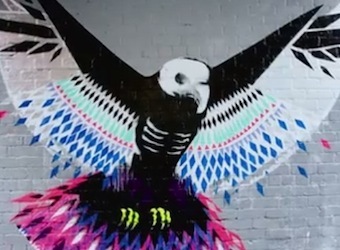 Graffiti artist Vexta has painted an eagle in a Melbourne laneway that signifies the sensation of flying, which halfpipe snowboarder Scotty James feels when he’s competing. ‘Design Your Moment’ is also being activated at select Telstra stores where Australians can use a Samsung Galaxy Note 3 device to create a custom screensaver for their compatible smartphone featuring Vexta’s eagle artwork. For the Games, Samsung has re-launched its ‘Samsung Stadium’ app, featuring comedic sports commentators Roy Slaven and HG Nelson who will also feature in a television program on Network Ten for the Sochi 2014 Olympic Winter Games. Roy and HG’s Russian Revolution @ Samsung Stadium will be produced by Network Ten and will also be available on the Samsung Stadium app after it goes to air. Roy and HG will also record a show, Ice Stream each night, which will also be available on the app. The marketing campaign is supported by a media campaign across outdoor, broadcast and digital outlets. Together with Network Ten, Samsung will also extend the broadcasting of the Sochi 2014 Olympic Winter Games on Twitter using its new Twitter Amplify service. Samsung’s CMO, Arno Lenior, says, “Following the success of Samsung Stadium for the Lions series, and our nation’s love of Roy and HG, it seemed only fitting that we bring these iconic commentators back for the Sochi 2014 Olympic Winter Games. The campaign concept, Samsung Stadium, was originally developed collaboratively by Razorfish and Octagon.